You Always Remember Your First Time. . . . 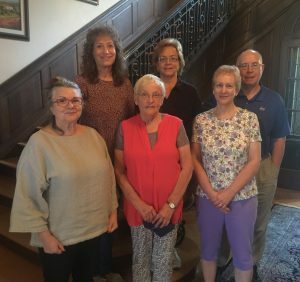 Your First Franklin County Genealogy Workshop, Of Course! Yes, it’s over *sad face* but it was so much fun! A great group attended our first “Finding Family in Franklin County” genealogy workshop. Because of their honest feedback, I am calling this our Pilot Program. I especially enjoyed catching up with everyone at breakfast and dinner. My first question was always—hesitantly—“Did you find any new records?” And the answer from everyone was, “YES!” Someone even found a real live cousin! Wednesday night, we met for dinner at the James Buchanan Pub and Restaurant for great conversation and discussion of plans for Thursday—where people going and what they were looking for. On Thursday morning we met for breakfast to give everyone an encouraging send-off. Individuals went to the Conococheague Institute in Welsh Run, Fendrick Library in Mercersburg—actually 2 people went there Wednesday before and after dinner—the Franklin County Historical Society and of course, the much heralded Franklin County Archives. Coincidentally, everyone was researching in the south-western part of the county, so they could discuss where they were going and what resources they were looking for. As I checked in at the various repositories, it was evident that everyone was doing fine, and appreciated the time to research on their own. We met again for dinner and to share what everyone found. Justin McHenry at the Archives was clearly the star of the day, finding records that others were not aware existed. On Friday morning, at our final meal together, the group openly shared their thoughts on the workshop. This was a true debrief of what everyone liked and what could be improved for next time—and there WILL be a next time! Because of the great relationships we developed in three short days, we got excellent feedback on what to continue and what to add. Some of the suggestions were to include historic tours as an option, rotate the venue around the county, discuss more about cemeteries and church records, and include more “locals” from the genealogy community—all ideas that we will definitely look at incorporating into the next session. I couldn’t have worked with a better team. Thank you Janet and Justin—and my advisors!! After the group picture—it’s what we genealogists do—I thought everyone would head home, but I was wrong. After checking out, everyone went on another excursion, either to a repository or sight-seeing around the county. And I went home, satisfied that we did what we set out to do—help others Find Family in Franklin County. Sometimes we are lucky enough to have a friend who entrusts us with a special gift. About a year ago I was that lucky person. And about a month ago, my friend—who is the most magnificent writer—shared her story. Mitchell Kyd, AKA Yvonne Butts-Mitchell, said that I could share it here. As genealogists, we are told to analyze documents to glean and evaluate every bit of information we can. We check for originality, who provided the information, and if the information is direct or indirect (or negative) evidence to answer a question we have about our ancestors. It sounds so impersonal, until someone like Yvonne tells the story behind the research. Yvonne handed me her gift–a letter written in November, 1926. Following is the story she wrote about that letter, based on my genealogy research. Please check out her blog, Dead Mouse Diaries, for great reads about everyday life–the life that most of our ancestors led. In a very ordinary way, my cousin Candy handed me an extraordinary gift last spring: a little, yellowed envelope she had found among her mother’s things. The postmark was pale and blurred but discernible: November, 1926. It had been addressed to her grandmother Florence. Why her mother had kept it all those years remains a mystery to us both but Candy knew I’d enjoy it. Although we shared a grandmother on our dads’ side, the letter had been an exchange between our maternal grandmothers, mailed to hers and written by mine. At first blush, it was an exchange of news between two high school friends who had been separated by distance and life changes. From the start, it offered the promise of a delightful peek behind the curtain for this storyteller, but something seemed unsettling. I knew instantly the thick, black pencil strokes on the envelope didn’t look like my grandmother’s handwriting but the name in the return address seemed unmistakable. In the style of the day, the writer had used her husband’s formal name, my pap’s, with a “Mrs.” preceding it. When I pulled out the letter, I was thrown off again, struck that the writing style seemed off somehow, not my grandmother’s fluid lines and careful grammar. I skipped ahead to the signature on the last page. Again, it was signed as “Mrs.” The writer was certainly my pap’s young wife. It was a line of news on the second page that stopped me cold. The letter told of family deaths, including the writer’s sister who had left seven young children behind. I remember running my finger over the handwriting then, looking again at the signature, going back to the postmark. My grandmother never had a sister and she married Pap in 1930. The tears welled up as I realized then what a treasure I was holding in my hand, a key to a family mystery. When I was very young, Pap used to take me to visit a woman we called Grandma Horn. Although she was always delighted to see us both, and always treated me with the best grandma-like affection, I never understood how our lives fit together. My “real” grandma, Pap’s wife, never went with us but always sent her regards. Grandma Horn returned the sentiment. I don’t remember when Grandma Horn died. I didn’t go to her funeral but I’m sure Pap did, probably 50-something years ago. Sometime after that, I started to catch bits and pieces of her story: my pap had been married once before and Grandma Horn had been his first mother-in-law. The letter I was holding had been written by her daughter Helen. In very vague terms, I’ve known for decades that Pap’s first wife Helen had died and that he had lost an infant son, too. End of story. Even my mother didn’t know much more. The hush wasn’t really a cover up, I learned later; the memories were simply too painful. Time passes; memories fade. The generations before us disappear and are reduced to an occasional comment at a random family gathering. I learned nothing more about Helen or their son until my mother showed me her cemetery marker three years ago. Grandma Horn’s first name was Ida; she had been a maid. Helen’s dad, Grandma Horn’s husband, was David, a laborer, who was 23 years older than Ida when they married. Both had children from former relationships. Although Ida could read and write, David made an “X” on the marriage application rather than adding a signature indicating he was illiterate. He did own property which meant he had made his way in the world, regardless. Helen was born March 2, 1909. While her marriage to my pap was not recorded in Franklin County, her letter to Florence reveals they married on February 26, 1926, just before her 17th birthday. It’s unlikely that she knew it when she was writing to Florence in November, but she was probably two months pregnant at the time. Other records show that her infant son died when two months premature, on April 12 , 1927, two days after my pap’s birthday. Helen died one week later when she was barely 18. The baby’s death certificate calls him “John.” I’m guessing that at the time of death, Helen was too ill and my pap too overwhelmed to have declared a name. When the obituary appeared a few days later, the baby’s name was listed as Charles David, a combination of both grandfathers. Helen’s obituary in the local newspaper attributes her death to pneumonia, like most others listed that same day and the week preceding. March 2, 2017, would be Helen’s 108th birthday. Ironically, she shared that birthday with my great-grandmother, pap’s second mother-in-law. I realize now that day that must have been rough for him to celebrate as the rest of us gathered for her cake and ice cream each year. Helen did not leave a written account of her short time here and until last year, she was merely a cemetery marker in my layer of family history. One little letter has made her real for me and helped me pass along a part of her story. Happy birthday, Helen. You and the little soul who was among us barely long enough to get a name have not yet been forgotten. And to Florence, Roberta and Candy– thank you for recognizing and preserving the power of a letter. The other cool thing: Helen and I share a birthday! As I prepare to leave for the Salt Lake Institute of Genealogy (SLIG), I’m also getting ready to spend three whirl-wind evenings at the Family History Library. According to my SLIG syllabus, it’s “the largest genealogical library in the world.” So most people would assume that I’ll head straight to the Slovak resources. But not this time. Next week I’ll concentrate on the US and Canadian ancestors. But why??? 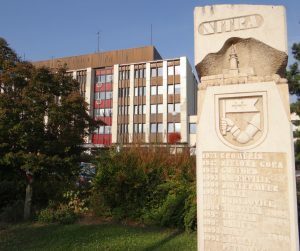 After we did all we could via e-mail, we set our meeting date and place—Nitra City Hall, in the town where my grandmother grew up. At City Hall, we got my great grandfather’s death record and my grandparents’ marriage record. We were given the certified transcript, but were also allowed to view the actual registry to see if any other information might be apparent. Unfortunately no copies or photographs of these registries are allowed. And again, the birth place of my grandmother was not listed. But because the family was Roman Catholic, we decided to walk to the parish and see if there might be a church marriage record for my grandmother, giving me her birth place and the church they were married in. As luck would have it, the office was closed. 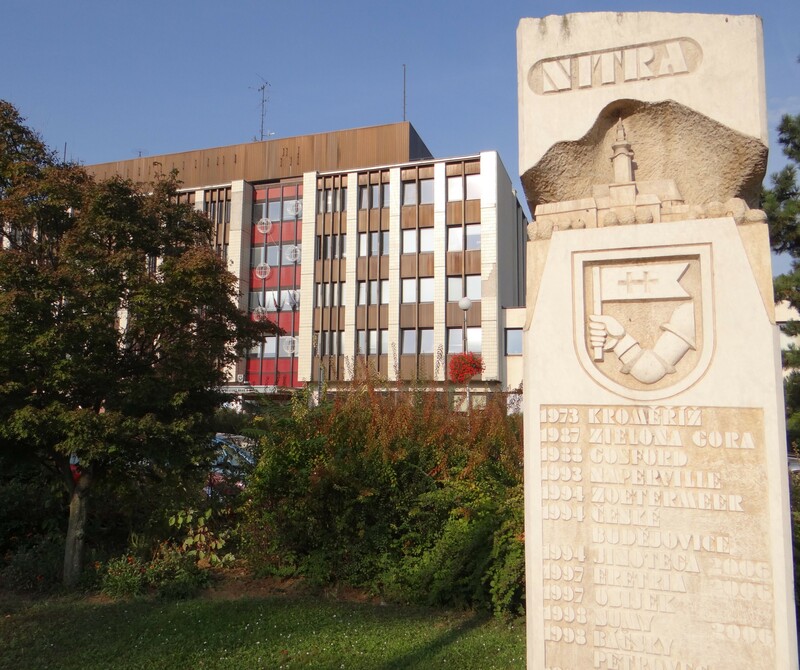 Our next stop was the archives for the Nitra region, similar to our county archives. There we found a 1919 census record on microfilm. Unfortunately the copier was not working, so I was allowed to photograph the screen on the reader. It gave information typical to a US census—address, family members and birth years, nationality, religion and literacy. The next leg or our trip was to Sered, where my grandfather grew up. Two years ago, a mystery was discovered that to this day has not been solved—but Peter and I have not given up. My family has always known our surname to be Pracser. But in all the Slovak records, my grandfather’s and great grandparents’ surname is listed as Konas. The first time Pracser is noted is on the ship’s manifest when the two couples immigrated. To try to get to the bottom of this mystery, Peter suggested that we check my grandfather’s sister’s birth record—she was the youngest—at the Sered City Hall. Again, the name was Konas. BUT, because Peter asked to look at the original registry, he turned the page and saw that Elizabeth had a twin brother that was stillborn. I would never have known this without the help of an experienced genealogist who knew the system and the language. Three towns and two repositories later, it was time to say good-bye to our new friend and guide…until I returned home! Once at home, the question of my grandmother’s birth place continued to nag at me, and I still hadn’t contacted the Catholic Parish. I emailed Peter, and he said that if I wrote the letter, he would translate it for me. I wrote, he edited and translated and off it went in the postal mail. Within a week, I received an email from the pastor, asking me if I spoke Slovak. I said no, but copied Peter, who said he would translate for me. Almost immediately, I received another email with attached scans of the marriage registry—with my grandmother’s birth place! It was not Nitra, but what looks to be basically a small town grown up around a train station, a town called Čiky, part of Palárikovo. Peter found her birth registry on FamilySearch, then ordered the record from the archives. Was the family traveling to Nitra when they had to make an impromptu stop to welcome my grandmother?? We may never know. My final question—for this round—was what church did my grandparents get marry in? 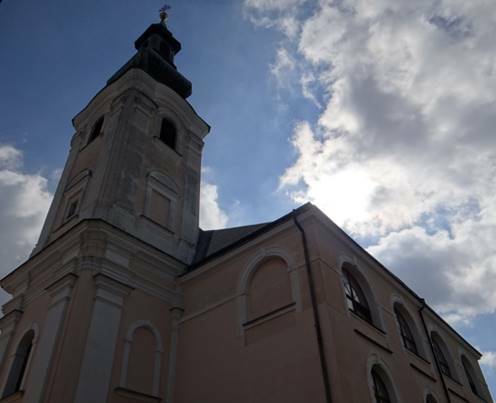 The pastor quickly responded to my email: St. Peter and Pavol Church, the church we visited on our first trip to the Nitra Castle, closest to their home. 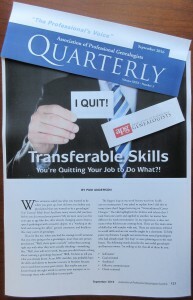 Many thanks go to Peter Nagy. I know that I couldn’t have been as efficient or thorough without him, and that he will continue to be there for me as I continue the quest into my Slovak ancestry and the Pracser/Konas mystery. 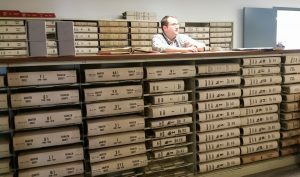 I’ve written before about the Pennsylvania State Archives, and about the wonderful staff and their records. I’ve solved many clients’ genealogy problems because of my monthly trips to Harrisburg. 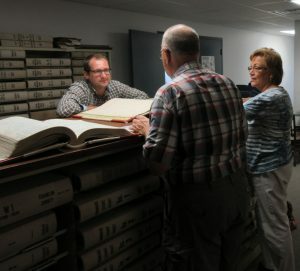 However, many people are just now learning about the not-so-new resource right here in Franklin County – The Franklin County Archives. The Archives are run by Director, Justin McHenry. 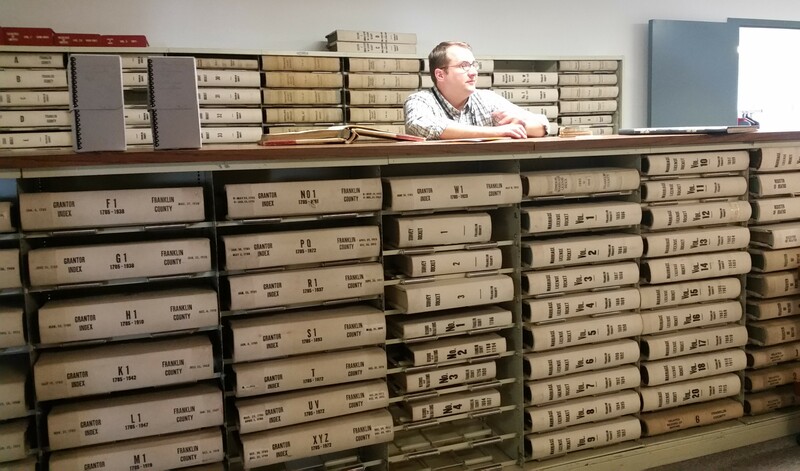 Justin and his three staff members are responsible for preserving all of the records created by Franklin County Government since the county was formed in 1784. 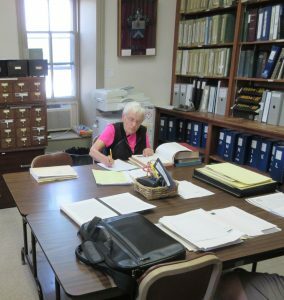 According to their website, “The Franklin County Archives is dedicated to safeguarding and preserving its history and heritage as well as providing the public with access to the documents and records pertaining to the history, administration and operation of the County.” To genealogists, the most important part of that statement is “providing the public with access to the documents and records.” And that is just what they are doing. 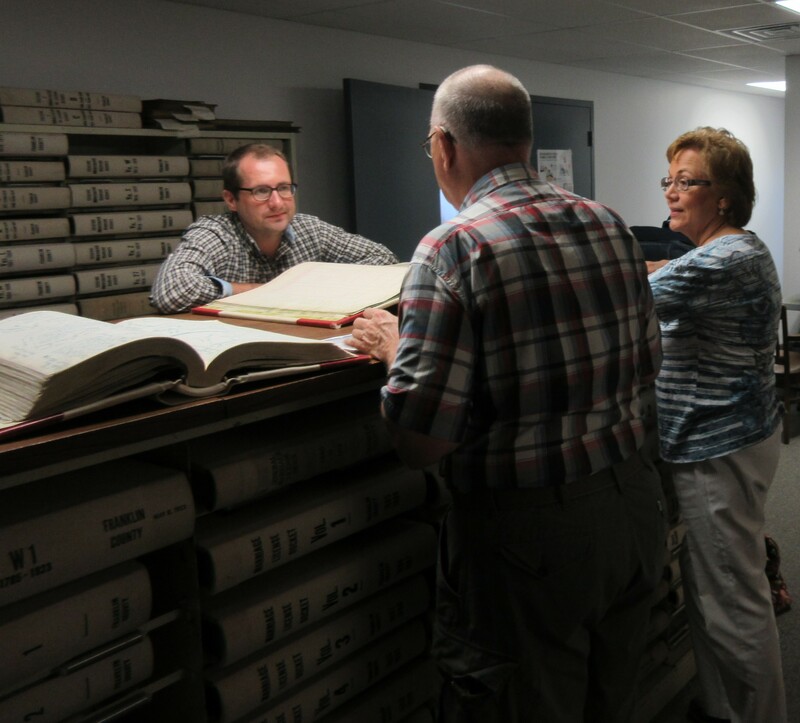 A couple months ago, I brought my Menno Haven Retirement Communities genealogy class to the archives to learn about the resources that are housed at there. Justin explained that the records of most interest to genealogists are being moved from the Courthouse to the Archives, and slowly being scanned so they’re available online. The goal is a one-stop-shop for people who will eventually be able to research their ancestors from the comfort of their own home. At this time, most of the records from the County Clerk’s office have been transferred to Justin’s care – Orphans’ Court records, such as tax records and delayed birth records; also, naturalization records, administration papers, early land warrants, early rough draft surveys. Some records, like land records and tax assessment books, are categorized by township on the website. If Justin has any records in his possession that aren’t already online, he will scan them and place them in the “requests” category – NO CHARGE!!! Change is usually difficult, but those of us who do genealogy research in Franklin County are excited about this change and look forward to more documents online, easily accessible to the public. Thank you, Justin!! Association of Professional Genealogists’ New Author – It’s Me! What a great present I found waiting for me after a ten-day vacation to Slovakia. It was my first article for the Association of Professional Genealogists (APG) – and it was chosen as the lead article for the APG Quarterly September 2016 issue. The APG is an “international organization dedicated to supporting those engaged in the business of genealogy through advocacy, collaboration, education, and the promotion of high ethical standards.” Many of my clients have located me through this website. And I too, found an amazing genealogist, Peter Nagy who I worked with on my trip to Nitra and Sered, Slovakia. Like my past articles, the editor and APG Publications Advisory Committee worked with me to make this submission its professional best, and I thank this wonderful editing team for their help and guidance. One week ago, I returned from my second National Genealogical Society Family History Conference in Fort Lauderdale, Florida. The first one I attended live was in 2014 in Richmond, Virginia. What a difference a second conference makes! Every level of genealogist attends this conference, from beginner to pioneer – and you can learn from all of them. Every year you go, you will re-connect with people you met before, they’ll introduce you to new people, and someday, you will become the one doing introducing! Working the Association of Professional Genealogists booth – or any booth – is a great way to meet cool new people. Networking is easy at luncheons, ProGen gatherings, or just sitting next to someone waiting for a lecture to begin. 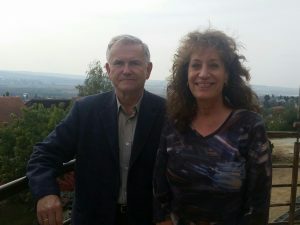 Supportive spouses and partners who “aren’t all that into genealogy” rock! Legends in our field are approachable. Citations don’t have to be complex or intimidating to write. Indirect evidence can be just as powerful as direct evidence. I really DO know some of this stuff! BCG (Board for Certification of Genealogists) certification is doable! Next year’s 2017 conference will be in North Carolina – driving distance from Franklin County, Pennsylvania. And I can’t wait to re-connect with all my old and new friends. Maybe I will be on the clock for certification by then?!? 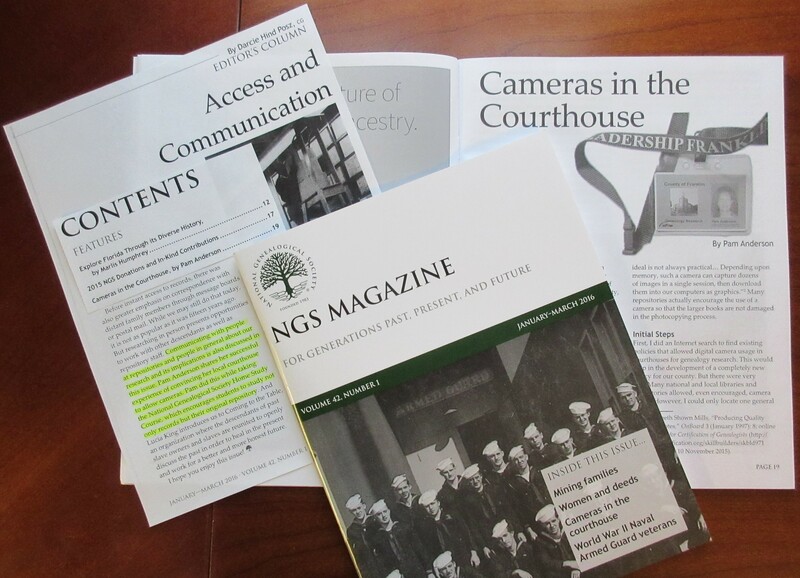 Genealogists from everywhere encounter roadblocks to accessing genealogical records, and making copies of the ones they are lucky enough to find. So I decided to write up my experiences and submit an article to NGS. I enjoyed the collaborative process of working with our courthouse officials and staff to carefully craft a policy that could work for everyone. And they now have a better understanding of genealogy, its documentation requirements and standards. But the best thing was stopping by each office, showing them the final product, and thanking everyone for making it all happen. Excellent, timely service; clarity on job to be done; superb reports with reference to clearly identified documentation. I found Pam Anderson Through Find A Grave. I was trying to locate where my Great Grandfather was buried. She volunteered to look at old funeral records for me. However, she could not find anything. Either the records were misplaced or lost. Several months later through my researching I found him. I placed a request through Find A Grave to have a picture of his burial place. She went out of her way to fulfill my request. I cannot thank her enough for her help and generosity. There are no appropriate words in terms of my gratitude for all the time you invested in making sure Helen will not be forgotten after her very short time here. Thank you for all this and more. Pam is very easy to work with, and provided plenty of ideas to follow up on. It is always a great surprise when someone really does a top notch job; and achieves a high standard. Very nicely done. I am very impressed. To all at – and especially to Pam for searching, scanning, and sending me EXACTLY what is needed for a DAR verification! Your positive, helpful, cheerful, quick response was wonderful! You did a great job! I really appreciate the diagrams of each cemetery. I hope to get to visit these graves one day but surely don’t want to have to wander around looking for them. I’ve taken many gravestone photos and seen many more; I know it’s hard to get the light just right so the words show well. That takes a special knack which you clearly have. I really really appreciate it! I received your report package and I am very pleased with the result. I liked your enthusiasm and attention to detail. It is obvious you like the ‘search’ as much as the client. Looking forward to Phase II. Once we have the families located, we can build the biographical sketches. Please enter your email below to receive upcoming news and updates from Anderson Construction & Genealogy.